DS Dental offers teeth whitening treatment in London. Teeth whitening has become very popular in recent years. It is one of the most popular forms of cosmetic dental treatments. The procedure can change the appearance of your teeth within few hours for an attractive and beautiful smile. Our dental surgeons, dental practitioners, and dental therapists perform teeth whitening that will offer you the perfect smile. Before undergoing the treatment, consult with our dentists to find out if you are a candidate for this form of teeth whitening. Want to know more about teeth whitening? Find your nearest dentist here. How we whiten your teeth? Our dental surgeons will create an impression of your teeth to form a mouth guard. He/she will tell you how it should be used with a bleaching gel. You will then apply the gel regularly at home using the mouth guard for a specific time period. There are some whitening gels that can be left on for nearly 8 hours that will lessen the treatment period to one week. Another kind of teeth whitening we provide is laser whitening. In this process, a bleaching product is painted onto your teeth and a laser or light is shone on them. Our surgeon will provide you with a customised tray used for the maintenance of your new tooth colour. Laser whitening can be done in an hour, which makes it very convenient for busy professionals. At DS Dental, we understand the importance of having a beautiful and confident smile and we are happy to offer our valuable clients a comprehensive range of whitening treatments. 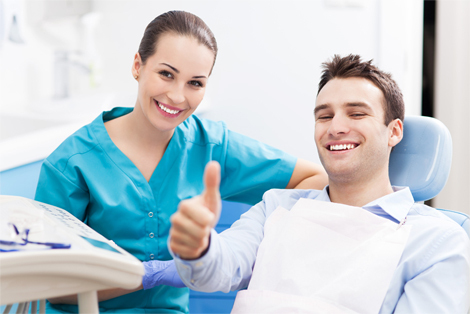 Sometimes, thorough teeth cleaning is not sufficient and we require the attention of experts. Our medical staff is friendly and we give you the chance to fix an appointment at your convenience.